We went to Norwich yesterday to go to the theatre and stayed overnight. Our hotel was overlooking Norwich Cathedral and the first thing we did once in our room is get our bins out to scan the area and cathedral spire. 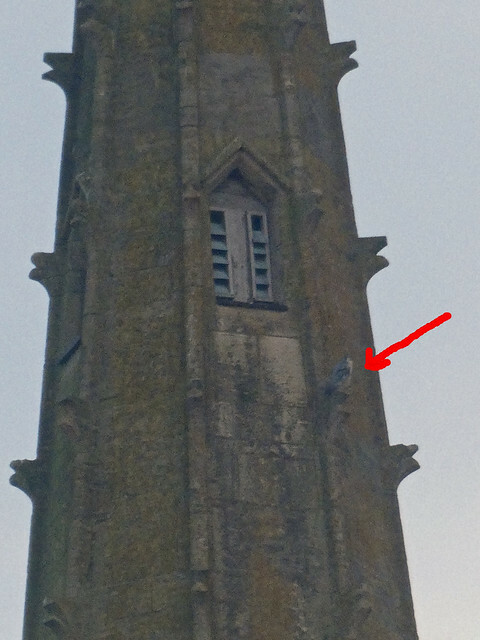 Such a shame the windows were so dirty as we did manage to spot both peregrines but all our pictures were very murky. This was the best from our new bird watching hide !! Today we visited the cathedral and managed a few slightly better pictures. You can get far far better views of Norwich Cathedrals Peregrines from their web cam. Our pictures are not helped by the fact that the spire is the second tallest in the UK. This next one is even higher up. This is the nest platform showing the web cam and from April you can get to a viewing platform. This is part of The Urban Peregrine Project with the Owl & Hawk Trust. 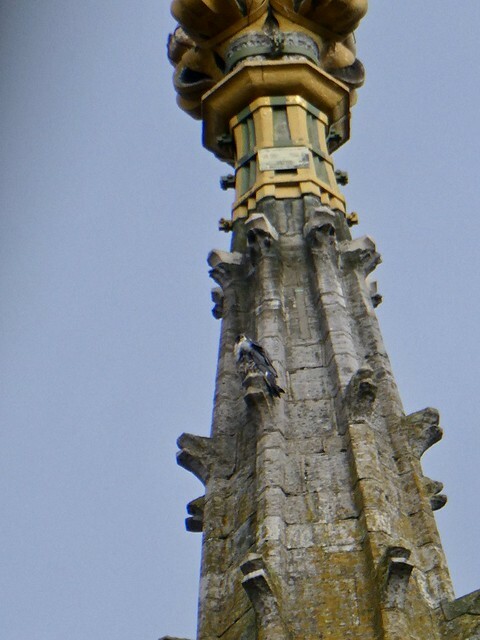 Norwich is a challenging 315ft high but even though our pics we not great at least we saw both birds from our hotel bedroom hide and from the cloisters. I have a low church tower across the road at home ... if only. Cracking shots Tony regardless of distance, it's always nice to see Peregrine shots. I have a low church tower across the road at home ... if only. 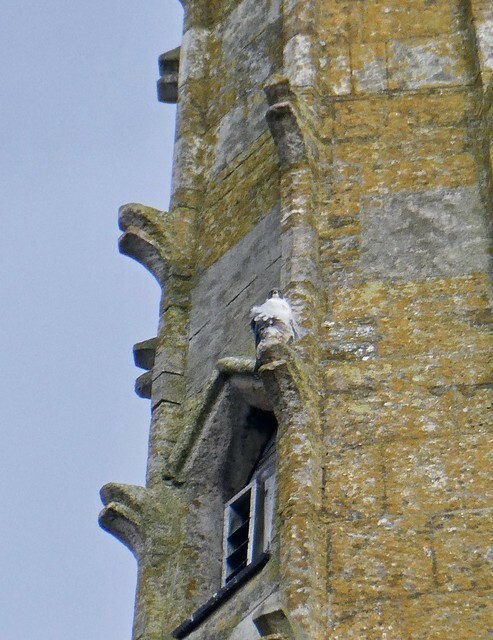 Depending on any Peregrines nesting in the area it is always best to keep an eye out and then approach the Church to see if they will allow a box to go up. The Sheffield Peregrine family are spreading with one of the offspring now breeding at Wakefield. I have a pair in a quarry near me that gets raided every year so I approached the local birding club to see if the nearest church would agree to a box and they said yes straight away. 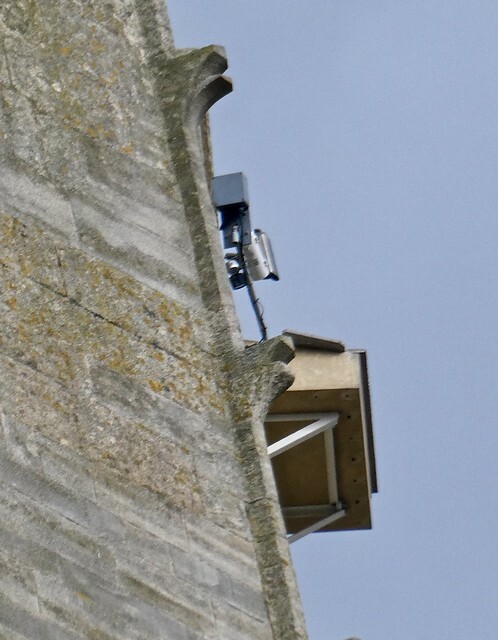 Thanks Alan, we just loved the idea that we could peregrine watch from our hotel room to start with. I know we have kestrel, sparrowhawk & buzzards around here and occasional kite but have unfortunately never seen a peregrine in the area, if a pair should turn up I would definitely try your suggestion. Oh damn just looked up from typing this and we have a blizzard outside, at least that saves me from Tesco. Lovely to see the area around the web cams so thank you , I have scapped a couple of pics from the web cam and posted on the thread.